I wanted to share my newest video here. This is inspired by Lori over at Happy Birds Glitter Nest. 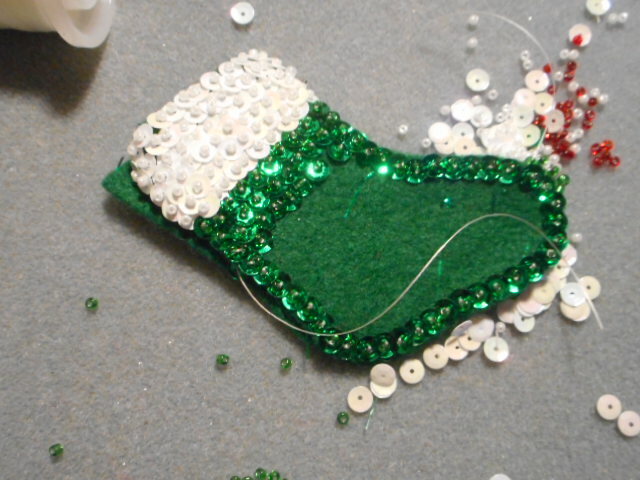 She did a great tutorial she called DIY adorable Shabby Chic Stocking Ornament. 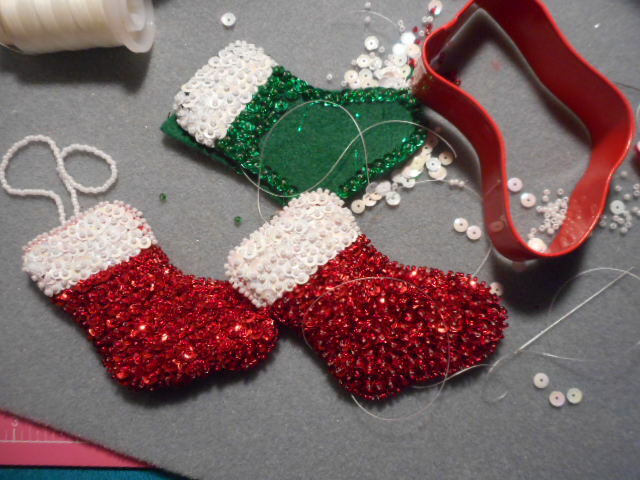 I loved it and it inspired me to do this simple stocking. 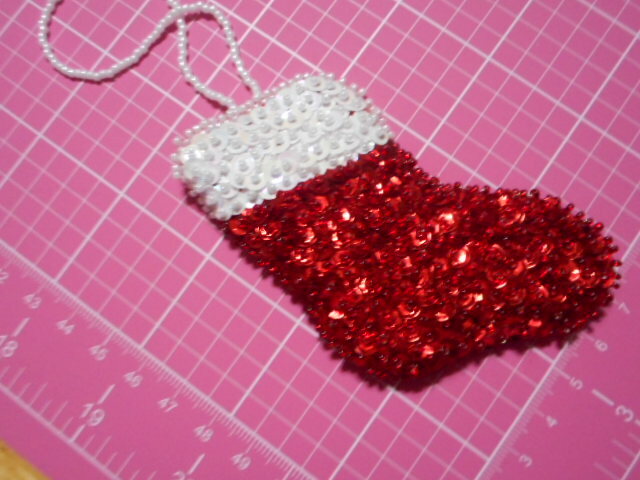 Her stocking is very pretty and not simple looking at all. I liked the contrast. Here is the link to her site and the video. I had a rough couple of weeks, we had our fridge go out on November 8. It is just over a year old and they had already come out a few months ago and replaced the compressor. I did not realize it was not running right until later the next day. I had a few of our grandkids over on Saturday and kept accusing them of using all my ice, nothing was coming out of the ice maker. They all assured me they had not touched my ice !! They spent the night and in the morning I thought, aha, they have been asleep all night, I will have ice this morning. But, nope, no ice. I checked it, it was on. Finally by that early afternoon I noticed the ice cube trays I used for back up were soft, and not frozen anymore. So, Monday we called Best Buys Geek squad, and had to deal with LG as they do not let the Geek squad handle their products, they send out their authorized people, which was pretty strange to me, because a Sears guy shows up for my fridge I bought at Best Buy. So, he deems it unrepairable. Very slow leak . It had taken until Friday to get him out, so now it was the weekend and we had to wait for LG and Best Buy to figure this out and then it was Thanksgiving, still no fridge. We got by with frozen bottle of water, we have a small chest freezer where we froze the bottles and rotated them, and that we kept in the fridge and freezer as it was still slowly leaking coolant and I was able to keep both at a high fridge temp until the last few days. I could not keep much in there but some fruit I already had and bags of ice for drinks and a few things and our son has a small dorm fridge in his room and we were able to keep some stuff in there. I have a counter top ice maker that I pretty much ran all day every day, dumping out the water as it melted in the bags, right back into the ice maker. Finally got the fridge delivered on Thursday and what a stressful day. My friend Laurie was going to come over to be there with me when they were coming between 2:30 and 4:30 , as I had my 16 month old grandaughter that day but they showed up at 9:30 and she had just woken up when I texted her to let her know they were early. This fridge is a beast, 30 cubic feet, and they could not get it out of the house. In 15 years of my husband being at his job, I have called him at work twice. When my dad died and when our plumbing blew in the outside wall of the kitchen, both over 10 years go. I had to call him to have him tell them how they got it into the house. This took about two hours or so. The baby was mad she was confined and it was a long morning. My friend showed up at the end of it, and went and got us lunch !!! But we had the fridge , which is my dream fridge, just a nice freezer drawer on the bottom, double door fridge on top and the deli drawer in between. I love it and by Friday morning it was cold and we were able to go shopping that night and fill it back up. We tried to get Direct tv and change our internet to ATT to get a bundle with our wireless. There was some crazy mixup and my husbands name was all messed up and they said his credit was like 350 and he had no history with the house we bought almost 18 years ago, or his cell number he has had around ten years. All crazy and wrong. It took me two hours on Friday , again with a baby, on the phone with 8 different people before I got my deposit reversed and the appointment canceled to get that wrong name off. Baby pitching a fit a few times . She needed her nap and I never dreamed this would take over two hours. She got her second wind, and never did take a nap.She got lots of hugs and kisses though for me being on the phone that long. So, I was pretty worn out and wanted to do a tutorial, but something simple and could not figure out a simple tutorial I wanted to do. I saw Loris video about her stockings and bingo, that was it. Already had them cut out, and very simple and easy. I loved that it was so different from her video, yet inspired from hers !!! Here are some pictures and the link to my video. 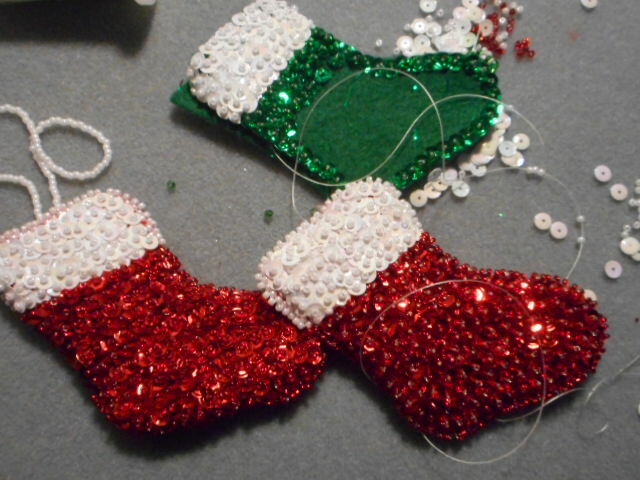 I used all simple materials easily found at Michaels and Hobby Lobby. 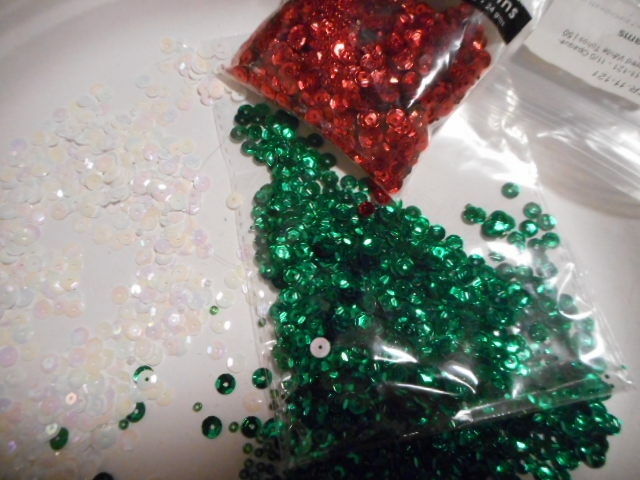 Red and green metallic sequins, white iridescent sequins, and seed beads in the same color, white beading thread, and red and green felt. 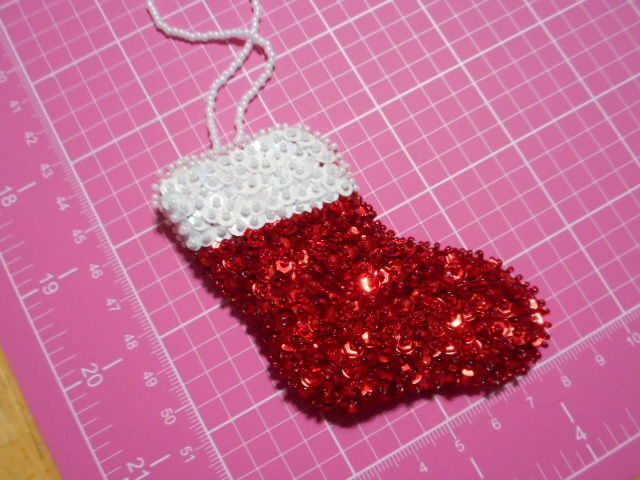 I used a stocking cookie cutter as well. All are easy to find and really inexpensive, which is fun to me. I love taking simple and inexpensive materials and making something really pretty out of them !!! Thanks so much for stopping by ! !, I will be back soon !! !